Just as the writers style makes him choose one word over another, the architects style chooses one detail over another. Scott paid attention to details. 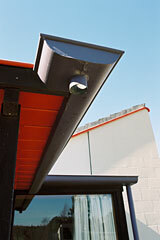 Scott had a fascination with guttering and guttering details are one of his signatures. Even in the early buildings he is using gutters that have short returns around corners, which are more decorative than functional. 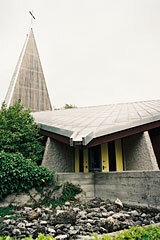 Both the Futuna Chapel and Our Lady of Lourdes have rooves with extravagant gutters. 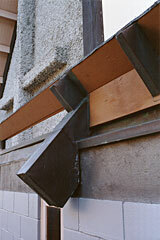 And the Maori Battalion Memorial has cast-concrete gutters that extend beyond the edges of the roof. 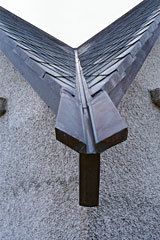 St Canices has stainless steel guttering (with short returns around each corner). Why? Because it looks good. 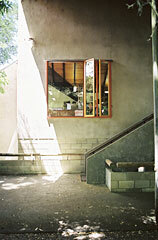 A Scott building is recognisable by its windows. He sees the window as part of the wall, in proportion to the wall, dividing the wall, contrasting with the wall, integrating with the wall. 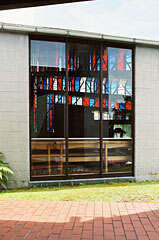 Scotts windows are always well proportioned, as are his walls, but the two together are greater than the sum of the parts. There is a consistency, an internal logic, to Scotts buildings and to his detailing. He has a set of rules that he applies to solving design problems, which develop over his career. These rules are about: appropriate proportions - simplicity - honesty to materials - structure, the bones of a building, as a design feature - the importance of how materials connect to each other - buildings needing a human scale (we need less room than we think). While Scotts sense of proportion was intuitive, his buildings and his detailing are deliberate and well considered.